The centuries-old hot springs have been upgraded with modern facilities over time, and have become a favourite retreat and recreational site among locals and international visitors. From the Seririt-Singaraja main route, a series of village routes up the hills of the Banjar district lead to an intersection with clear signposts to the hot springs. At the spring’s site entrance, a ticket office is adjacent to a parking space. Cars and coaches stop here, while motorcycles are permitted further access along the row of shops to a smaller parking space next to a roofed stone gate with a signage that reads, “Permandian Air Panas” – ‘hot water bathing place’. The souvenir shops that line the route before the stone gate sell various items, from framed art, handicrafts, souvenirs, Bintang shirts to batiks and dyed cloths. The short pathway and bridge after the gate is by a small river, leading you to a further flight of steps. From here, the first smaller pools can easily be seen, where spouts gush onto visitors enjoying the soothing splashes. Further up the steps is a shop selling snacks and refreshments. The hot water springs complex comprises four main pool sections, with the largest and central bathing pool featuring a restaurant perched high above the northern side. Beside the restaurant are restrooms, lockers and changing rooms, and a spa and massage facility. The bathing pools are constructed around the hot water spring source and feature a tiered structure. The first level features eight dragon spouts with a smaller pool also adjoining this section. The large size of the central bathing pools enables families to join in on the soothing dip. Down on the second level is the main central pool. The hot water springs provide a recreational and therapeutic experience, due to the water’s sulphuric content. This can be seen from the yellowish red sedimentation at several points of the spouts and pool walls. The complex is known to have been further developed during the Japanese occupation of Indonesia during World War II. At the time, the waters of the hot springs were known to have cured various skin problems as well as rheumatic ailments. 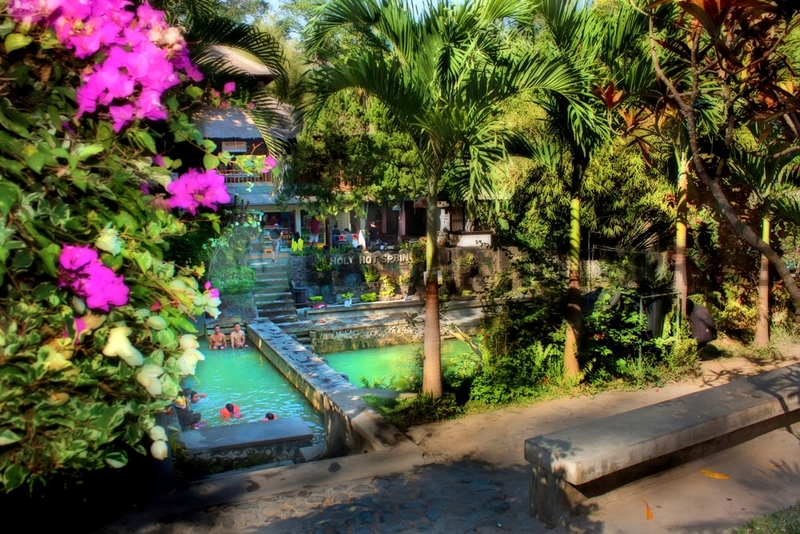 Banjar Hot Springs continue to provide an enjoyable and health-benefitting retreat up in the hills of the north, for those seeking relaxation, fun, sightseeing, and a totally different experience. Those not willing to go for a swim can easily enjoy the lush tropical gardens, or the view from above at the Komala Tirta Restaurant, or shopping for souvenirs at the rows of art shops just outside. 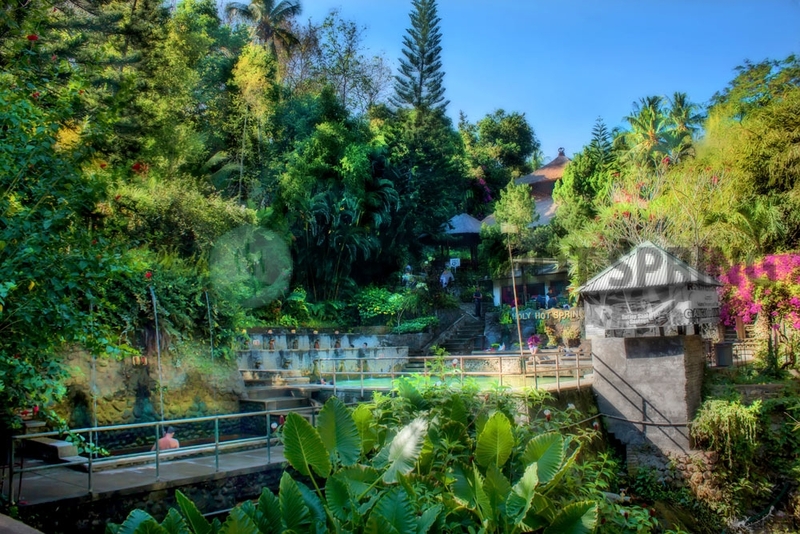 The hot springs are an easy itinerary on trips to North Bali, approximately 25km west from the town centre of Singaraja, the capital of the Buleleng regency.